The TORn Message Boards have been celebrating our Founders Day and our 15th Anniversary (TORniversary) all weekend! Come and join the games, tokens, food and so much more on the Main, Off Topic and Feedback Message Boards starting here. In the Reading Room, we are continuing our TORn Amateur Symposium: Abstracts for TAS 3. For those who don’t have the ways or means to travel to Tolkien Symposiums, this is for you. Join the latest event here. Want Hobbit Movie News? TORn poster DanielLB bravely ventures into the very rich and fast-moving Hobbit Discussion Board to collect The Hobbit Headlines of the Week. Check out the past 2 week’s action here. We’ll share more topics next week and hope you join in on the conversation! 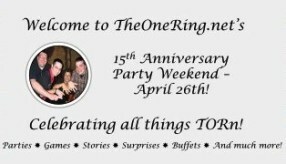 Don’t forget, TheOneRing.net’s Message Boards have over 10,900 registered Tolkien fans, just like you. Let your voice be heard!